Synaptics is one of the leading companies in biometric technology, and they've just announced a huge new breakthrough: in-display fingerprint sensors for personal authentication. Dubbed the "Clear ID FS9500", this new fingerprint sensor is designed for those now-ubiquitous smartphones with bezel-less displays, and provides on-demand biometric authentication within the display panel itself. After all the buzz about this technology throughout 2017, during which it was rumored to be included on Galaxy S8, then the Note 8 and on the iPhone X. But each time, this promise failed to materialize, with even Apple backing away and going with FaceID instead. But it seems like the wait is finally over. Synaptic has announced the start of mass production for clients that apparently include one of the top 5 smartphone manufacturers this year! According to an analyst from KGI Securities, we would have to wait until the Galaxy Note 9 release to finally see a fingerprint reader in action capable of hiding in a smartphone's display, despite the fact that Vivo had already shown this technology in (admittedly limited) action at MWC 2017 in collaboration with Qualcomm. Synaptic, a company engaged in the production of trackpads, digitizers for graphics tablets, various biometric devices and fingerprint readers for smartphones, has released a press release presenting to the world its integrated fingerprint reader, the Clear ID FS9500. This fingerprint reader has been specifically designed to allow smartphone manufacturers to continue with the current trend of shrinking bezels without sacrificing the convenience of a fingerprint reader on the front of the device. The technology works in this way in combination with AMOLED type displays: the sensor detects the presence of a finger resting in the display area, the OLED display illuminates the finger, the sensor captures an image of the fingerprint that is then compared with the saved image and in case of positive feedback guarantees access. The most interesting thing to note is that recognition takes place in just 7 milliseconds, making this unlocking method twice as fast as FaceID and on par with classic fingerprint readers. 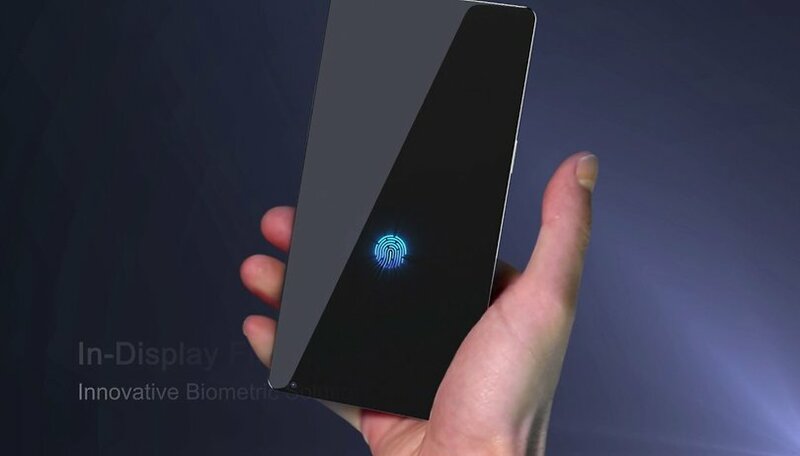 In addition, Synaptic has announced that this technology is ready for mass production and will be used in a smartphone from one of the 5 largest smartphone manufacturers. We have not yet been given any information on what we can do, but we can make some hypotheses. The first company that comes to mind is Samsung. The Korean company could already take advantage of this innovative fingerprint reader on Galaxy S9 despite some rumors suggesting a different direction. According to what has been leaked so far, in fact, Samsung would like to return to using a classic fingerprint reader on the back of the smartphone (better positioned than that of Galaxy S8 and Note 8) as well as an improved iris scanner. Thinking about what is meant by the "top 5 smartphone manufacturers", we have to keep in mind that many Chinese manufacturers are ranked even if they are not so well known in our market. In the above list we have for example Oppo (a sister company of OnePlus) incredibly popular in China. Vivo itself, mentioned above, could be a possible candidate. At the beginning of this 2018 we are also waiting for other top-of-the-range products launched by Xiaomi and Huawei. The innovative fingerprint reader could even in fact be used in the next Xiaomi flagship. It would be an incredible surprise to find it on the next Huawei smartphone. In fact, the company is already working on FaceID-style facial recognition for its P11 as well as a system of three rear cameras, according to rumors. The integration of an in-display fingerprint reader in addition to these other features would make this new smartphone the most interesting new device of the next year. I prefer a fingerprint reader to face recognition. For further clues, we can only wait for Synaptic will show its technology in operation at the CES 2018. We're looking forward to finding out who will be the first manufacturer to adopt this technology. Who do you think it will be? I'd rather have the fingerprint reader. Faster, more accurate. ONE step on my phone, press your finger against the sensor, unlocks and turns on. With face id, you have to turn on the phone, have it pointing at your face, then swipe up. A great innovation to say the least. Work out the bugs & away we go! I think everyone will enjoy this technology!